Here we present some ideas on how to experience Berlin without experiencing too much costs :)! We like to give you some nice suggestions on things to do in Berlin that are cheap or even for free. We know that a lot of the people staying at our hostel are traveling on a budget. We think you can have a lot of fun in Berlin and safe money while you are at it. Read on for some ´insider-tips`. If you are staying at our small hostel in Berlin, we are more than happy to give you personal advice on things to do in Berlin! In this popular jazz Venue in Belrin Mitte there are free concerts every Wednesday!. 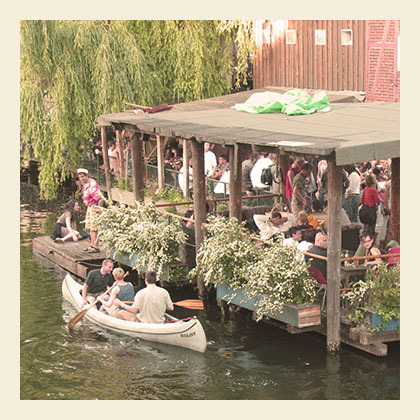 This club is the place to be in Berlin if you want to experience contemporary jazz! Located in the Rosenthaler Strasse 13, it is easy to reach by public transport, and it is withing walking distance from EastSeven! A 2 hour music experience, in the unique location of the Botanical Gardens. When the weather is good the concerts take place open air! Music from classical to jazz, from swing to flamenco, please check the program to know what´s on when. The entrance fee is 15€. Please note that these concerts only take place in July and August. You want to go shopping for clothes??? But you don´t want to spend a lot of money and you don´t want to shop second hand either?? Check out the shop called 24 colours, in Oderbergerstrasse. It is within walking distance from the East Seven Hostel. They sell really cool street-wear at H&M prices, nice! Go here to experience tasty vegetarian food and great handmade music! They serve delicious burgers (vegan), sushi, omeltte, soups and salads! It ´s really affordable, they offer a soup and burger combo for only 5€! If you enjoy drinking a glass of wine you definately must go here. They have an unique concept. When you get in you pay 2€ for a glass. After that you can fill up your glass as often as you like with different kinds of red and white wine. Afterwards when you go, you pay what you think it´s fair. A lot of young people go here, both tourists and students. That´s all for now. We wish you a fantastic and affordable time in Berlin!